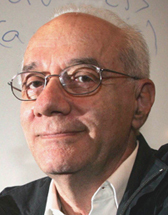 George Grätzer is a mathematician who has written books on TeX and LaTeX and edits a journal prepared in LaTeX. George Grätzer, interviewee: I am a mathematician, born and educated in Hungary. I came to North America in 1963 (first to the USA, then in 1966 to Canada). If you are interested in my mathematical papers, they are all posted on my web site. You will find there a listing of my books in three categories: mathematical, LaTeX, and others. Just last week, I submitted to my publisher my latest mathematical book: Congruence Lattices of Finite Lattices. It should appear late fall. Do not ask me what it is about. I also founded an international mathematical journal, Algebra Universalis, which can be accessed via my website. I am a member of various academies of sciences, have lots of degrees, one honorary. I have a wife, two children, and three grandchildren. DW: When and how did you first get involved with TeX and its friends? GG: In 1986, a short paper of mine, written in Word, was accepted in the Proc. Amer. Math. Soc. The letter of acceptance stated that the paper will be published in 48 weeks, however, if I submit it in AMS-TeX, then they publish it in 20 weeks. I did not know what AMS-TeX was, but a colleague of mine had a TeX with AMS-TeX, and offered to loan it to me. Over the weekend, I rewrote the short paper in AMS-TeX and submitted it. The paper was short and had simple formulas, so the transition was easy. (Unfortunately, the AMS twice misplaced the paper, and it was published much later — in 1988.) From 1986 to 1990, I wrote all my papers in AMS-TeX. Sometime, this was very frustrating. For instance, my paper #146 was a survey paper containing 30 theorems and 29 problems scattered into dozens of subsections. The constant reorganization of the paper was very complicated: AMS-TeX could not number! Of course, I could have switched to LaTeX, but I found LaTeX's ability to typeset math very limited compared to AMS-TeX. DW: Many people use TeX. Not so many write books and papers on it. How did you come to write these books for the TeX community? GG: In 1990, at the Kyoto meeting of the International Mathematical Union, the AMS released AMS-LaTeX. It was an answer to my dearest hopes: it married the mathematical abilities of AMS-TeX with the housekeeping abilities of LaTeX. There was only one problem: who could understand it? The documentation instructed us to read a book on LaTeX, one on AMS-TeX, and then the 100 pages or so of explanations that followed pointed out how AMS-LaTeX compares to LaTeX and AMS-TeX. I said to myself: there must be a better way. So I started to struggle with AMS-LaTeX and kept notes on what worked and what did not. Eventually, I decided to turn my notes into a book, so people will not have to go through the same struggle as I did. I also had a dream: my journal will receive all the contributions in AMS-LaTeX and we will not have the huge expense of having to typeset it. Today, 15 years later, this dream has come true. I am not a LaTeX expert, I do not understand the TeX language, I am just a user. I tried to turn this to my advantage. Since I have a difficult time (discovering and) understanding so many rules, I do two things differently. First, I write an introductory part to my book for beginners, so they do not have to go to page 240 to understand what every beginner has to know. Then in the reference part of the book I repeat what is in the introductory part, so the reader will not have to guess where to go for what information. Everything is in one place. Second, I explain all the rules with examples, lots of them; after all, most of my readers are mathematicians; they easily recognize a pattern when they see the examples. Formal rules come last. It was very rewarding that some 50,000 people chose to learn LaTeX with the AMS packages from my books and that the Mathematics Editor of Amazon.com selected my Math into LaTeX as one of the ten best books of the year 2000. DW: You mentioned your dream being achieved of not having to typeset your AU journal. That leads me to ask about how well you are satisfied with LaTeX and your class for the needs of your journal, or if and how you think TeX and LaTeX have to evolve to continue to be useful to mathematicians. GG: LaTeX and the au class (which is a slightly modified amsart) does the job for the journal. The major problem with TeX and LaTeX is that it is so badly coded. It seems to me that TeX is calling subroutines without storing the info where it is calling from; as a result, when something blows up in the subroutine, TeX does not know what went wrong, so the error messages are misleading or plain inappropriate. If you do everything right, TeX does a perfect job 99% of the time. If all users were perfect, this would be a nice work environment. But we are not. So we have to develop very defensive work habits. Recoding TeX would be nice, but I do not see it happening. LaTeX probably will develop but not the way it would be useful for us users, but probably to better serve the needs of large organizations — the AMS, the publishers. Now that a click or two produces pdf files from TeX, we can communicate with everybody — and electronically; this is very useful. My journal does not pay anything for postage any more, and communication is very fast. The next big thing in mathematical publishing will be color. In a few years, color printing will be cheap. This will be a very big problem for the mathematical community. Centuries of typesetting tradition tells us how to typeset mathematics in black and white. What happens when color comes in? Shall we do theorems in blue, problems in red? Who will develop the new standards? DW: You have contributed to the TeX community through your books that help people learn to use it. Are there parts of the world wide TeX community and infrastructure that you also draw on? Is there any sort of formal or informal community of users for specifically mathematical TeX and LaTeX users? GG: I got very generous help from the mathematical TeX community in the form of dozens of volunteers to read and criticize my manuscripts. Members of the LaTeX3 team and mathematicians from all over the world gave their time generously. Also, comp.text.tex is very useful; lots of experts give good advice. DW: I greatly appreciate your giving your time to participate in this interview, and I am ordering a copy of your Math into LaTeX today.